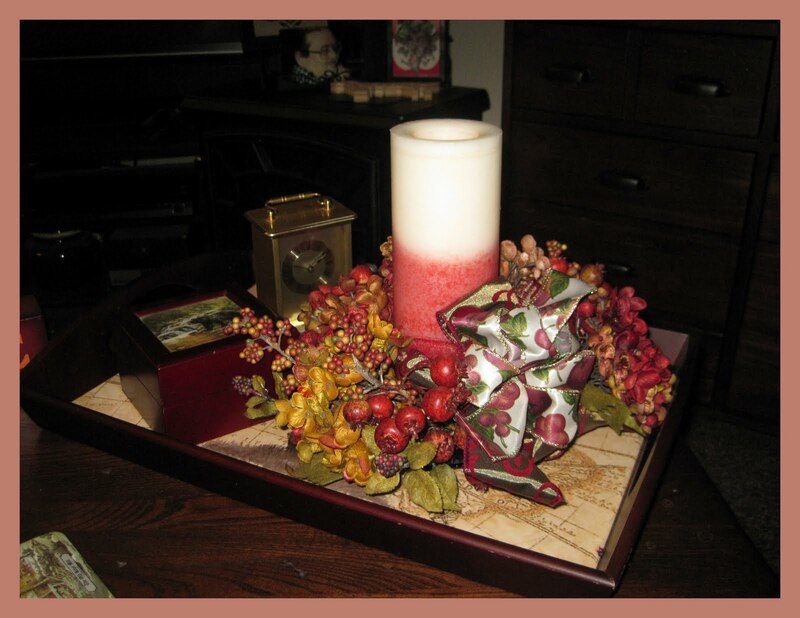 Here's a cute tablescape I did for autumn ... actually, I set this table every fall! 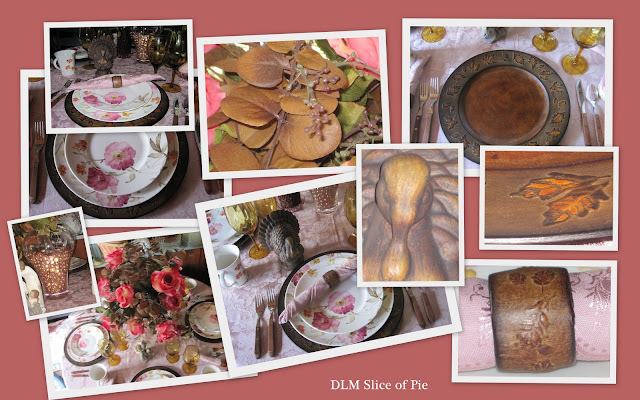 These pictures are from a workshop I taught ... so yes, one in particular looks like a college classroom! 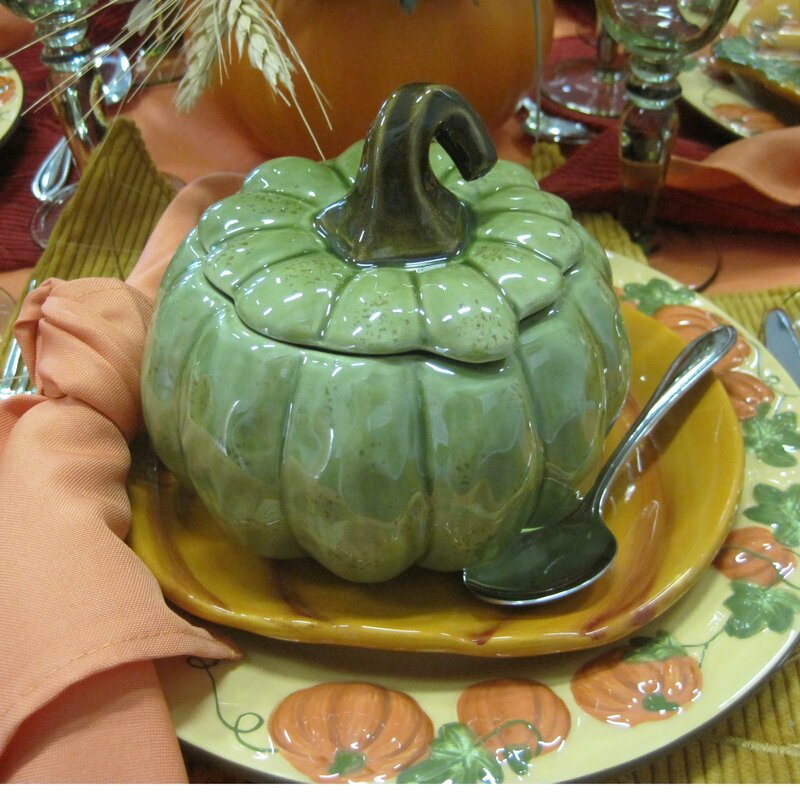 I particularly love the color of the green pumpkin/squash. 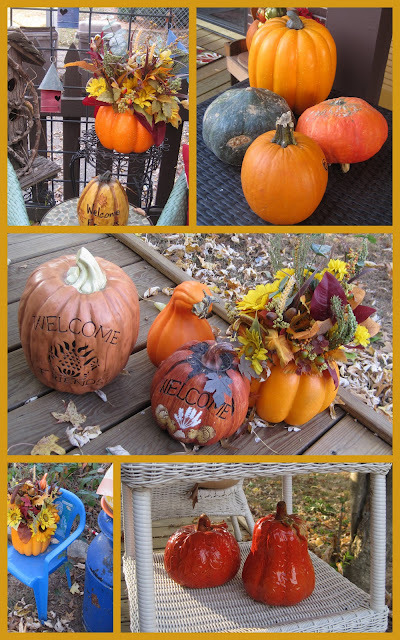 It is considerably different than what we are used to seeing .. .although I usually buy a couple green pumpkins ... that are technically squash ... I think! I'm linking with Tablescape Thursday so make sure you click through to see the other tablescapes. 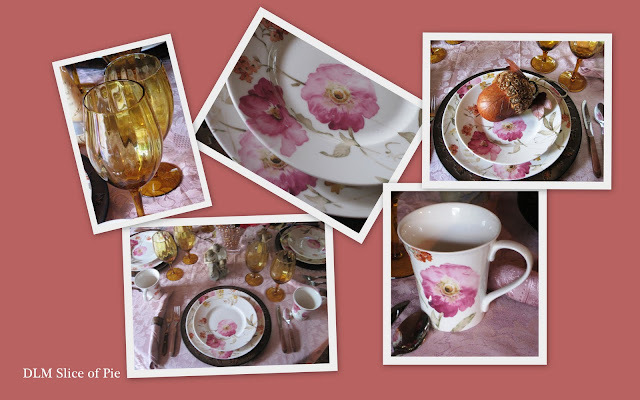 I'm posting this combination of pink china with autumn decor ... I used it some time ago as a teaching opportunity to demonstrate the use of atypical colors in autumn decor and tablescapes! 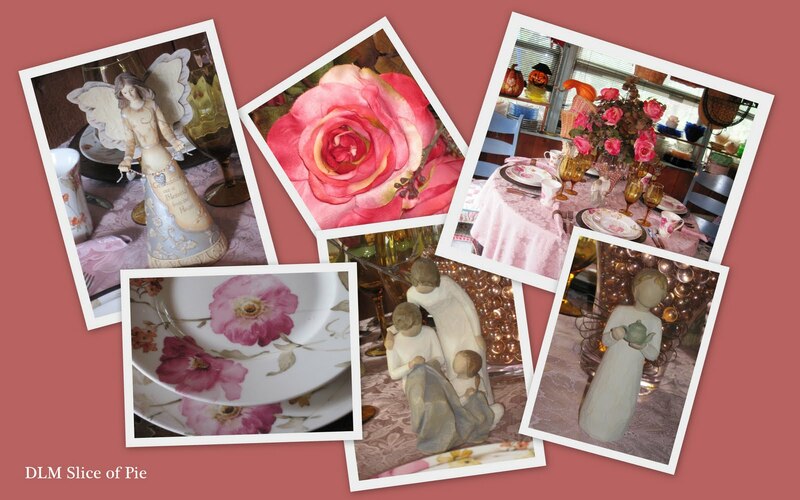 I'm linking to Pink Saturday, so make sure you click through to visit the other posts. 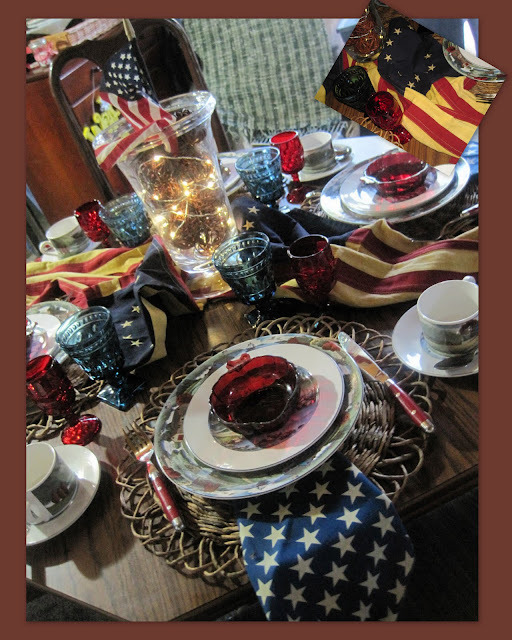 I want to be sure you visit my home page to see my September 11th post, too ... Have a safe weekend. I just posted this the other day, but given the importance of this day, I thought it appropriate to post it with Sunday Favorites and Seasonal Sundays. This certainly is an important day. I have spent a lifetime planning ways to share history and culture with people in ways that are easy to comprehend and understand ... from children to elderly adults. We raised our daughter ... and now want to influence our grand daughter's interests ... by teaching those lessons around the dinner table ... often times in association with the theme or the menu of the meal. What does all that mean? Well, how do you teach the lesson of 9/11 in a way that little children might understand, without frightening them? Did you know that September 11, 2001 was not the first time America was invaded on September 11th? You might want to read my cooking column from today's Southern Illinoisan Newspaper to find the answer to that question. Go to Made at Home to read more and find some great recipes. I'll give you a hint ... the Battle of Brandywine fought during the American Revolution ... and this table is a celebration of the freedoms we need to be remembering on 9/11 as we teach the lessons of that tragedy ... and commemorate the loss we experienced that day. 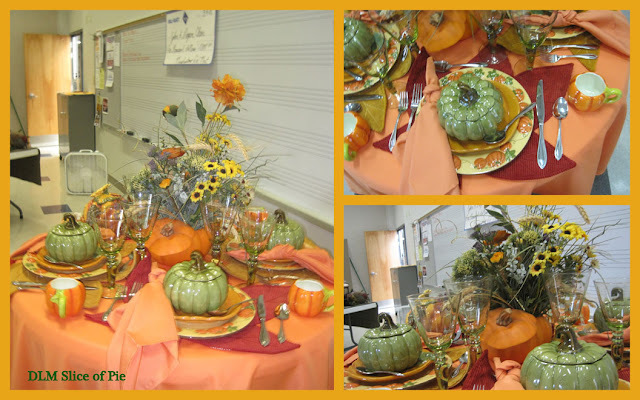 It's a tablescape ... it's a special menu you'll find in the link above ... and it is a teaching opportunity that you might want to ponder. 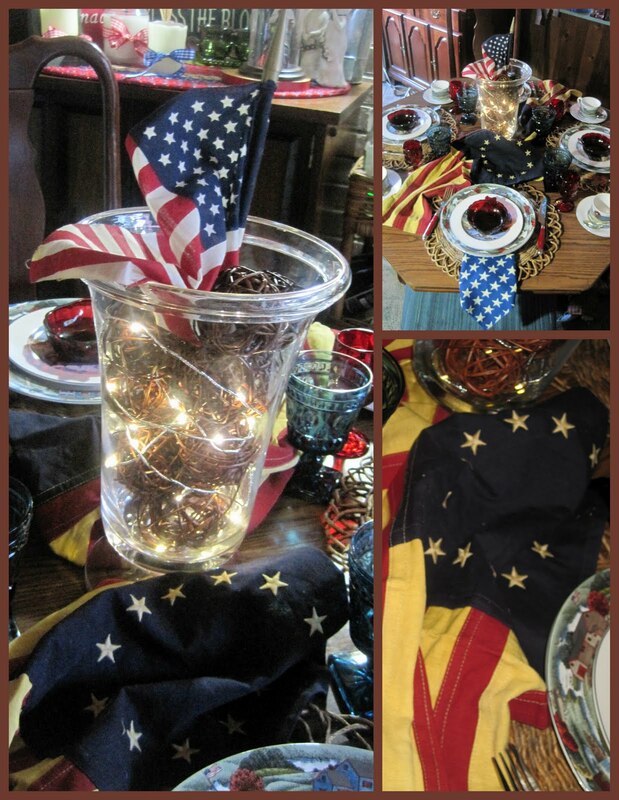 This tablescape begins with replica Betsy Ross flags ... so use this as a time to talk about Betsy ... you'll find lots of information on this Betsy Ross site. 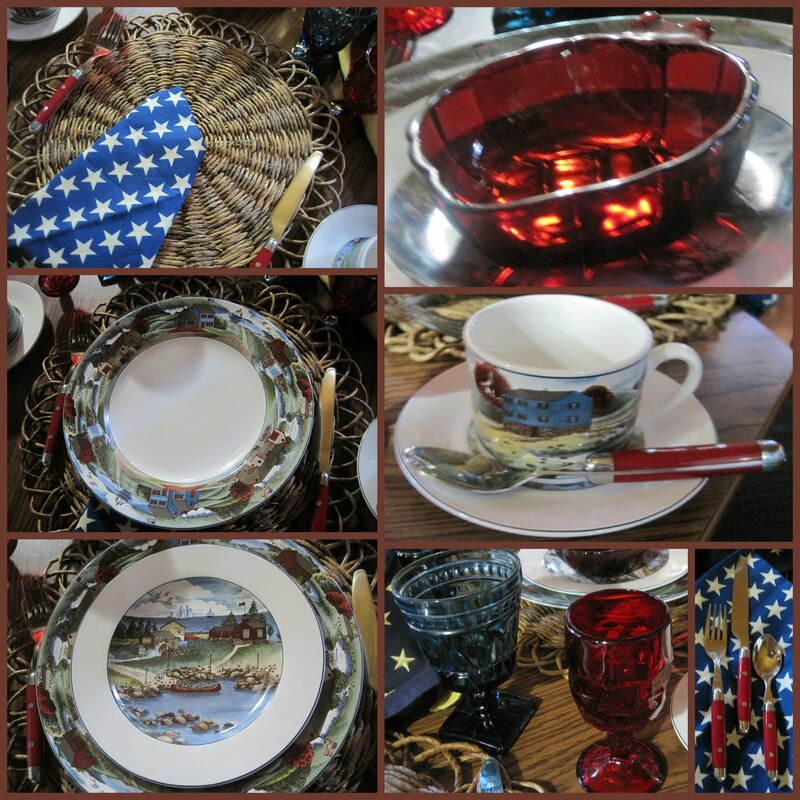 The china I've used is Noritake and the pattern is called Pioneer Bay ... and I can't think of anything better to use when celebrating the freedoms that our pioneer colonists fought for. 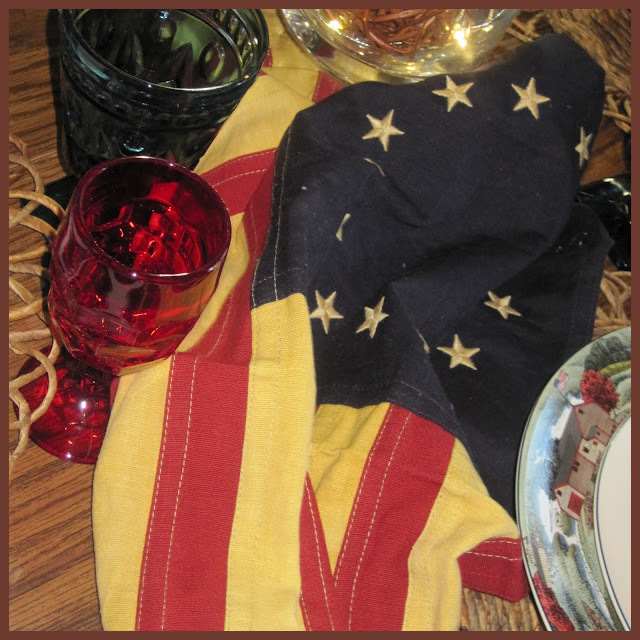 I love the rustic look of the placemat/chargers ... and the stars bandannas make perfect napkins. 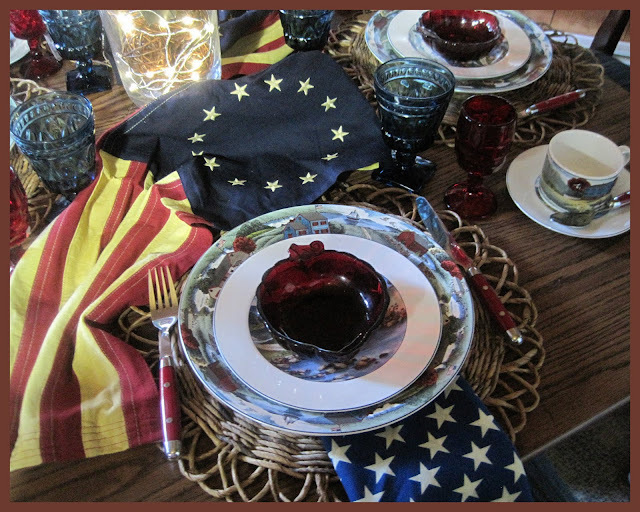 The placemats came from Pier1, the red leaf dish is Depression Glass, the blue goblet is Indiana Glass and the red wine glass is Viking in the Georgian pattern. Look more closely at the pattern on the china. The primitive buildings are so neat! I use this china often ... for any table that needs to be patriotic! The color palette for accessorizing it goes from patriotic blue to ambers and browns. Here's the centerpiece ... pretty simple, just a jar filled with grapevine balls and battery operated lights. Check QVC, if you like the lights ... they are on a timer, so once you tuck them down inside something, you don't have to worry about digging them back out! 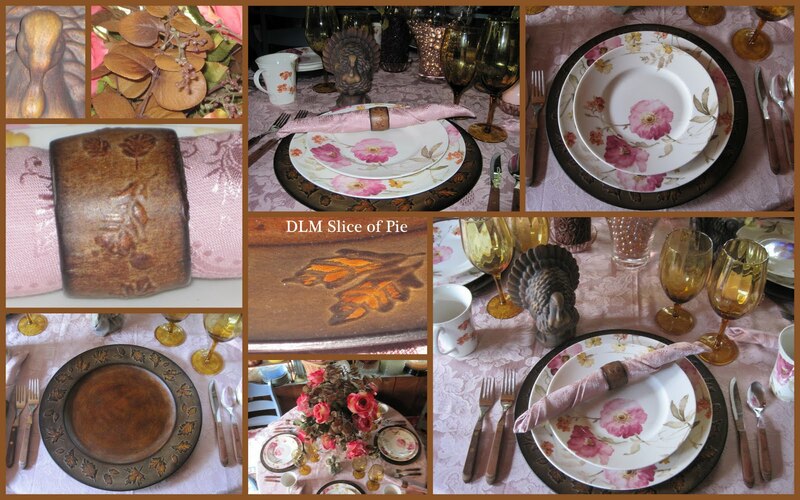 I'm participating in Tablescape Thursday so make sure you click through to visit the other posts! Be sure to visit the link at the top of this post to see my column about September 11th ... and visit my home page if you haven't visited my site lately. I have some neat posts! Celebrate Freedom! 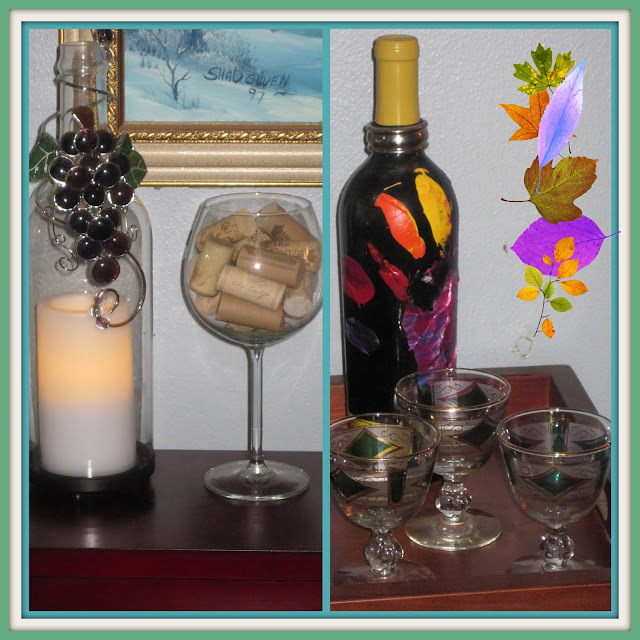 Wine on the Tabletop for Tuesday! Oh, I have wine racks all over the house! You've seen them in lots of posts. We love wine and because we have been so involved in our local wine trail, we keep lots of local wine around. We also enjoy wines from all around the world, so you can find just about anything on my racks. I wanted to show you a couple things on this little rack ... because they are cute. I'm posting with Tabletop Tuesday, so make sure you click through to visit the other posts! I've had this little wine table for years, and I originally bought it because the tray top comes off. I've moved in through several rooms and right now it is just tucked in the living room ... primarily to hold two things: the cute wine bottle flameless candle (from QVC) and the hand print wine bottle on the right. One of my friends gave me the bottle of wine with the imprint of the wine maker's hand on it ... for my 50th birthday! I've never opened it. The candle is fabulous ... I love real candles, but with two big dogs and a 4 year old ... flameless is a good thing! I added the stained glass bauble. Hope you enjoyed! 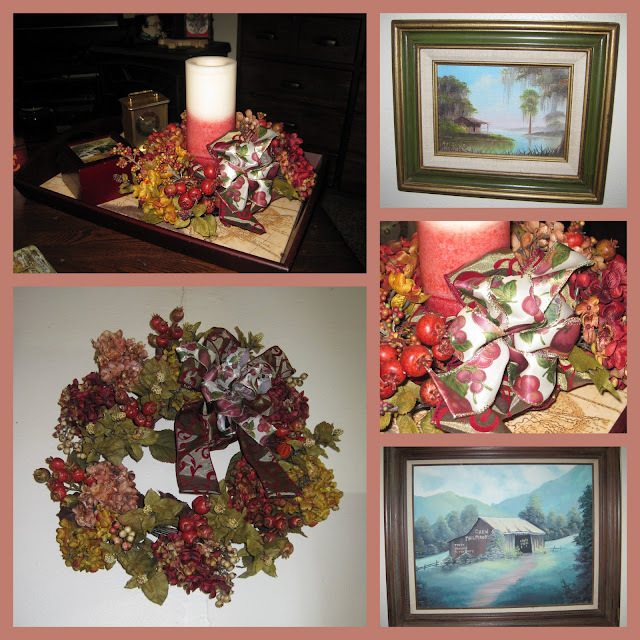 Make sure you visit my home page to see my other posts! Happy September! I'm posting with Sunday Favorites at Happy to Design, so make sure you click through to see the other posts! I'm not necessarily ready for Halloween, but I sure am ready for cooler temperatures. Summer 2011 in Southern Illinois has been pretty hot! So, here's to cooler temperatures in September! Be sure you visit my home page so you can see all my other posts! 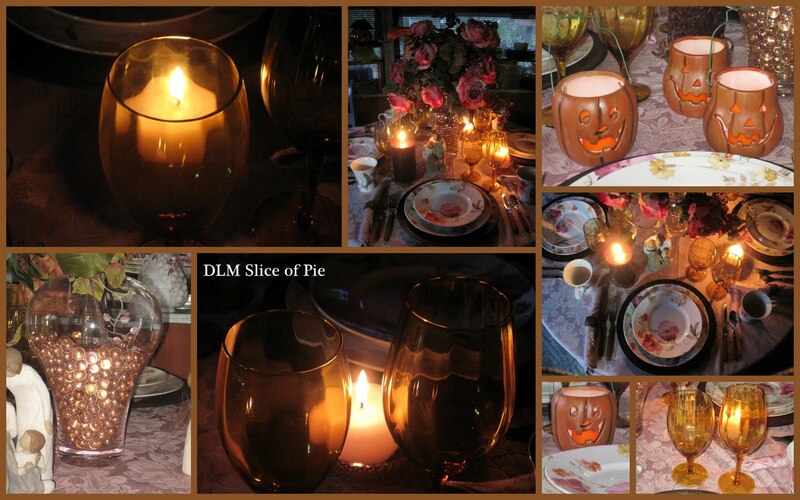 Happy Halloween - Welcome to Dinner! Welcome to my Halloween Girlfriends' Dinner Party! The girls are coming for homemade lasagna ... witchy style. The first thing they'll see when they arrive will be Miss Phoebe's decorating job on the front porch! 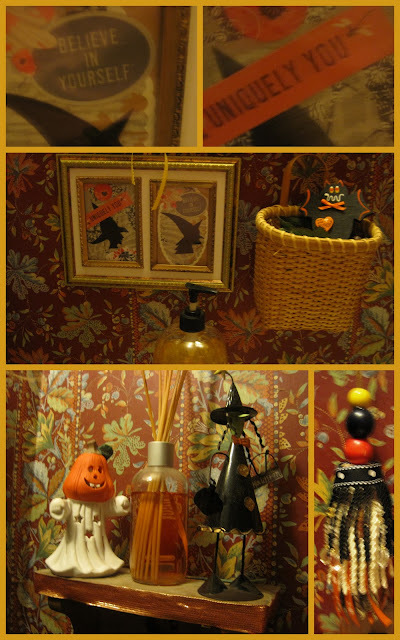 In the bathroom, they'll meet my two witch sisters ... who needed a little boost in their self esteem! Happy Pumpkin Party! 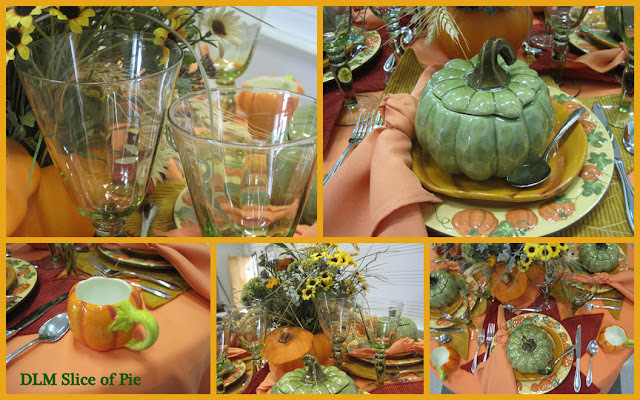 We're not done celebrating Halloween, so check back for Tablescape Thursday to see the last party in a month-long series! 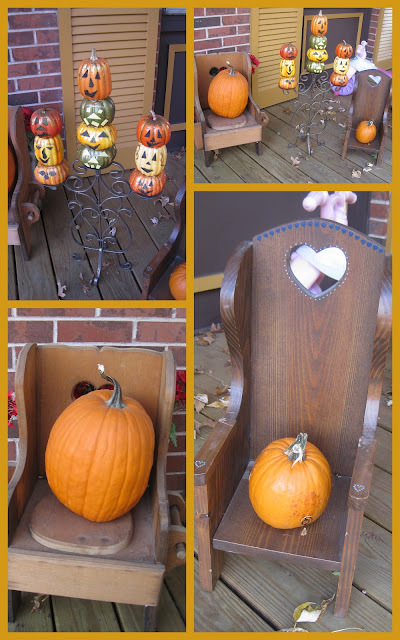 Make sure you scroll down my page to see all my Halloween posts! Special thanks to our party hostess ... you can click through her button on the left to see all the other posts. 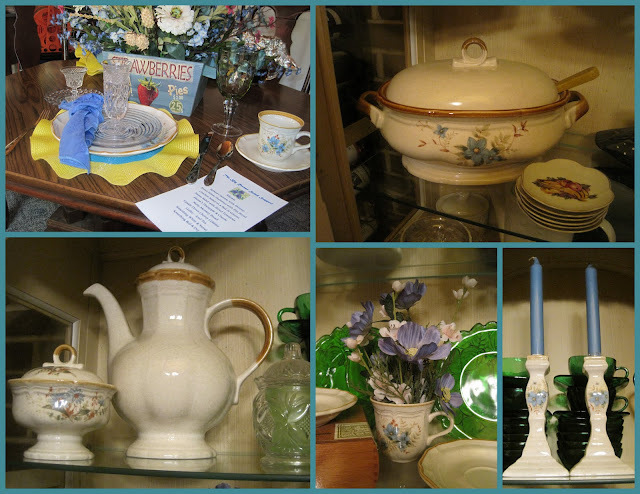 It may be hard to imagine, but I found a set of Mikasa Garden Club dinnerware ... service for 12 ... at one of my favorite resale shops! 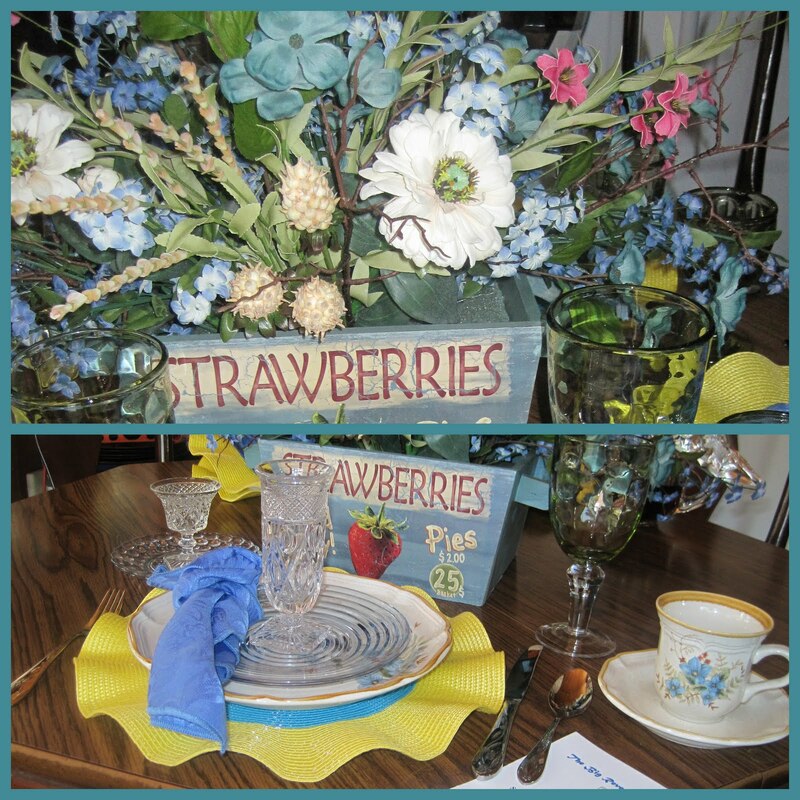 I used it at a recent girlfriends' salad supper at my house, so I thought it would be perfect to show off with Thrifty Tablescapes, so make sure you click through to see all the other posts! First, check out my home page and take a look at my other posts! Have a great weekend! 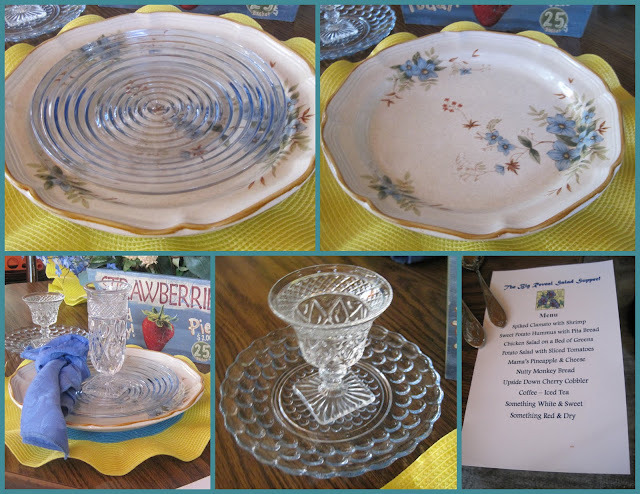 I used reproduction Depression Glass Manhattan salad plates that I picked up at a flea market years ago; Depression bubble bread and butter plates in blue that came from a yard sale ... and some of my collection of Cape Cod Depression Glassware. 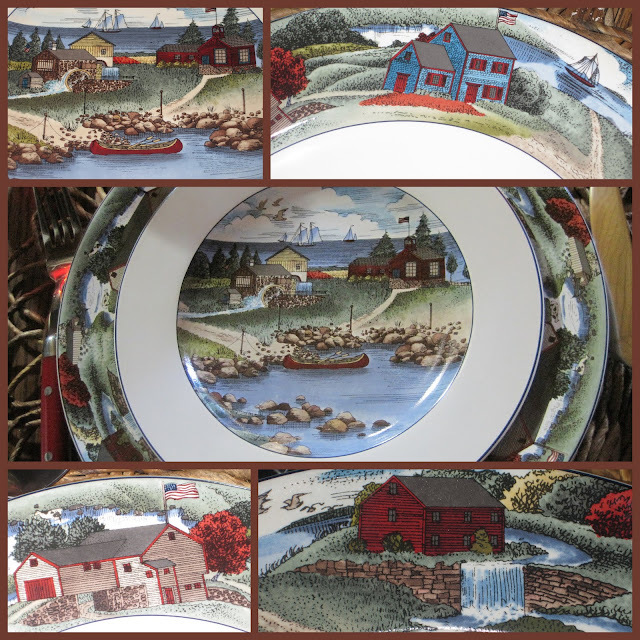 I've been collecting the Cape Cod for years ... a few pieces at a time from antique stores or ebay ... but one day I walked into the Goodwill and saw a couple dozen pieces of it. Of course, I bought it all! 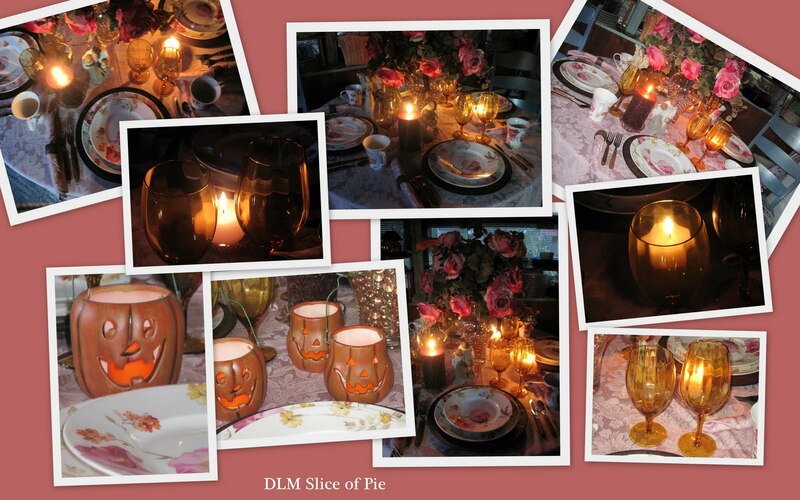 I always print a menu, so my guests know what to expect ... After I fell in love with the Mikasa, I looked for serving pieces on ebay and happily found the soup tureen and coffee pot with creamer and sugar ... and candle sticks. 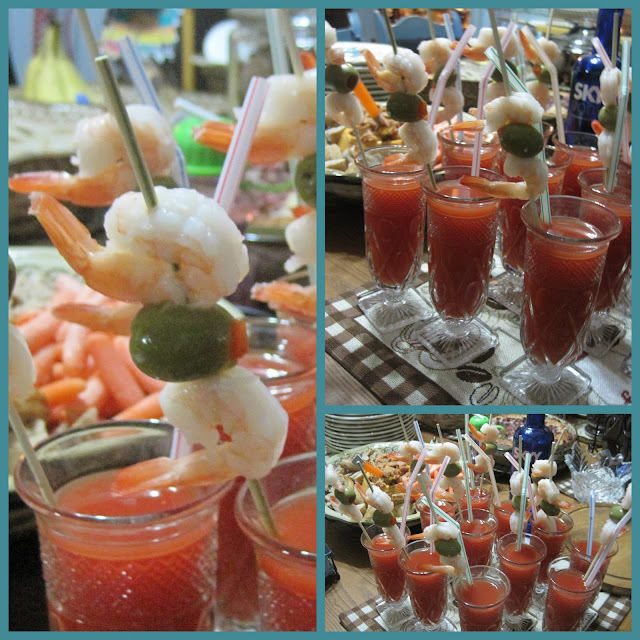 Our appetizer was sweet potato hummus with pita bread, but I dressed up our opening cocktails with shrimp on skewers! How cute is that? It's like drinking a shrimp cocktail ... use Clamato juice in your Bloody Mary and add a little horseradish to the drink with your other spices. The Cape Cod parfait glasses are the perfect size for a Bloody Mary! Hello Gang! 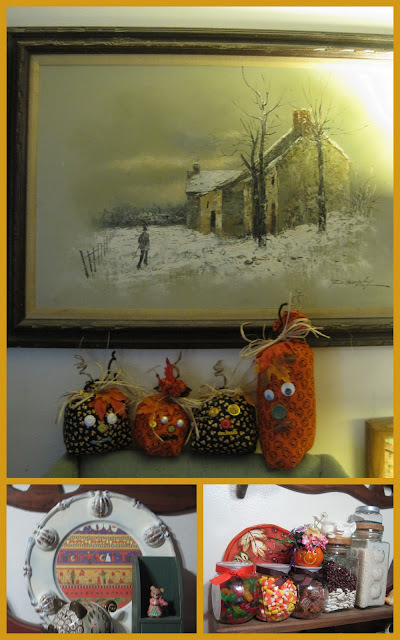 I've started doing a little Autumn decorating and since I have a new crimson sofa and chair, I decided that the typical orange and green color scheme in typical fall pieces wouldn't work. 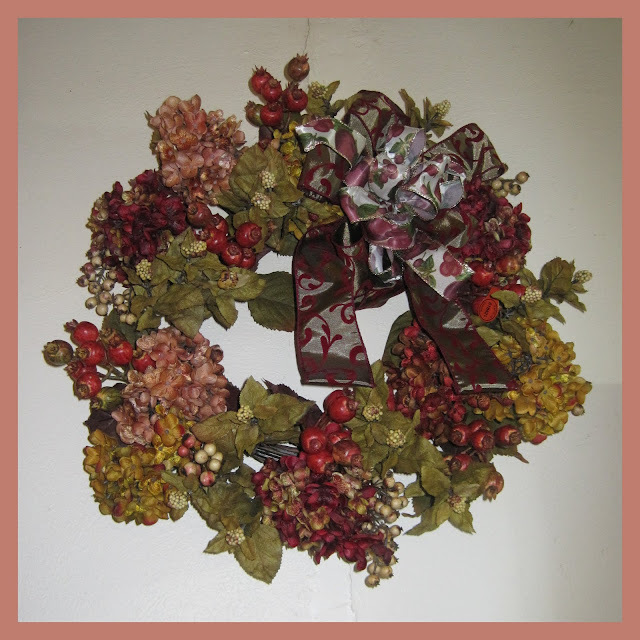 I happily found this beautiful wreath and candle ring that had some deep Autumn pinks in it and it works perfectly! I'm linking with Pink Saturdays, so make sure you click through to see all the other posts ... but first, go to my home page and look at the things I have posted. Have a great weekend!